This review presents the best beyblade burst toys in the world. First, a few words about how the products were selected. Who would have taught a game based on an anime manga series would become so popular around the world? Well, around the world people are re-enacting the epic battles via Beyblade burst games. The games are re-enactments of manga kids battling with very powerful spinning tops. The spinning tops or Beyblades are supposedly possessed by the spirits of powerful mythical beings and creatures. Beyblade burst game battles involve two players, or at most four, squaring off in an arena known as the Beystadium. The aim, in a nutshell, is to see whose spinning top (Beyblade) stays up the longest. Though only a few companies make quality Beyblade burst games, there are so many it can be difficult to pick the right ones. And of course, like every good product, fakes have flooded the market. The authenticity of the products – Because so many people want to make a quick buck, there are so many low-quality Beyblades and fakes. We looked at the quality of the products to make sure they were sturdy and strong. Durability is important here since the game involves a lot of collisions. Knock-off products without the license to make the product were discarded. Most of them tend to be made of cheap material and therefore not worth the hassle. Design – the designs of Beyblades are very important in how people, especially kids, relate to them. The most intricately-designed pieces tend to be a big hit among players. Products that were colorful and beautifully-made scored huge points with us. Launchers – Beyblade games usually come with two kinds of launchers: ripcord launchers and string launchers. Ripcord launchers work when players pull a ripcord to launch the Beyblade. They are more common. String launchers are operated by pulling a string. These produce more force and a higher level of spin on the Beyblades. Thus, string launchers took precedence especially if the Beyblade is a defensive piece since they need that stability that comes from a higher level of spin. That said, the first hoop to scale as far as launchers are concerned is the grip. Launchers with stronger grips were chosen ahead of others. The stronger grip gives players more control and the ability to do stunt shots easily. Reviews – User reviews played a huge role in the selection process. The job of picking out fake or sub-standard pieces was made easier with users’ opinions. Since these reviews are from people who bought and used the various products, manufacturers of fake products were outed and shamed. And among the quality products, the reviews pointed out which ones provided the best user experience. The Kreis Cygnus is a 4D-wheeled, high-quality Beyblade intricately designed as an attack and defense spinning top. It is one of the heaviest energy rings on account of being filled with iron powder. The presence of the 4D wheels enables it to slide 60° to either the left or right while spinning when it is attacked by an opponent. And it spins freely for at about 180° when it collides with other boys during battle. Easy to assemble, the defense and attack modes are activated by sliding the metal frame to 60° and fixing the metal frame to the core respectively. The Beyblade Burst Avatar Attack Battle Set is a complete set that two people can play with immediately out of the box. It comes with Beyblade burst; 2 energy layers; 2 forge discs; 2 performance tips; a Beystadium and accessories; two launchers; and an instruction manual. The Beystadium is uniquely designed to create exciting battle patterns. The burst top components are compatible with many other Beyblade Burst tops aside the Beyblade Burst Rip fire tops. But this burst top is compatible with only Beyblade Burst Beystadium. This Beyblade piece boasts very impressive stats in real-time battles. Fans of the manga series would be conversant with the Fang Leone 130W²D that appears in the show. It is a defense type Beyblade that evolved from Rock Leone 145WD and is owned by Kyoya Tategami. This Beyblade is made of solid and heavy material making it a great asset during battles. It features a unique wheel that can be flipped to switch the Beyblade between two modes: attack and defense. Its versatility and flexibility are underlined by the 2WD bottom which can be used for counter-attack and defense. This cute Beyblade Playset comes with a unique design with a belt clip so you can carry the launcher conveniently and be ready for battle without much fuss. The set includes 1 energy layer; 1 forge disc; a performance tip; a belt clip; strong launcher; and an instruction booklet. With this Beyblade set, getting the digital products is easy. Simply scan the code on the energy layer or string launcher to enable you to play the game in a digital Beystadium complete with energy layers and forge discs. The intricately designed Winning Valkyrie was made to intimidate and win battles. And its reputation as one of the most fearsome Beyblades precedes it. This is the third generation of the Valkyrie series. The starter set includes one complete Beyblade and a grip launcher. However, they are compatible with Beyblade Burst products only. The unique, almost all-metal top can burst other Beyblades easily. The bottom is designed to make it spin very fast and stay up longer when it is launched. This and many more in why Valkyrie is many hardened warriors favorite Beyblade. 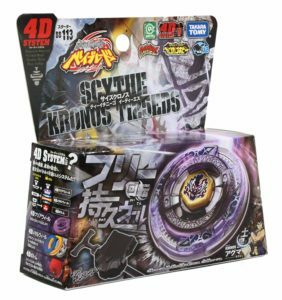 The Scythe Kronos is a colorful Beyblade whose strength lies in its stamina and is inspired by the character in the manga and anime series Metal Fight Beyblade 4D. The starter pack includes one light launcher; a metal wheel; one clear wheel; a track; one bottom; 1 sticker; 1 winder; and 1 track. Though primarily a stamina piece, a mode-changing feature can instantly convert it to an attack Beyblade. Its incredible balance is as a result of the EDS (Eternal Defense Sharp) feature. This Beyblade set is the best present you can purchase for someone just starting out with the Evolution series. The starter set comes with 2 launchers; a cool Beystadium; two strong Beyblades that can burst during battles; and left/right spin tops. The star-shaped Beystadium makes for an interesting battle arena. Though, it gives undue advantage to beys that stay at the middle because it is easy for aggressive beys to hit the edges and lose some spin. Basically, this is a top product to purchase since it performs brilliantly on many fronts. Many avid Beyblade gamers swear Nightmare Longinus is literally a ‘god’ because it is so good at winning games. The left-spinning Beyblade is a huge upgrade from the previous iteration of Longinus. It is very strong and very hard to burst. The ‘spikes’ on the spinning top are strong and sturdy making it easy to vanquish other Beyblades. It is uncommon to find a Beyblade you can put a frame on combined with the absence of a disk. This is a rare Beyblade you would do well to purchase before it becomes extinct. The Phantom Orion B:D is a resilient, stamina oriented Beyblade that is specially designed to include a ball-bearing that is similar to Wolborg MS from the Hard Metal system. The ball bearings give the Phantom Orion so much stability and stamina that it can do a solo spin for over seven and a half minutes. Furthermore, on the stability front, its weight of about 3.4 ounces makes it one of the heaviest spinning tops. This weight enables it to knock over many other challengers. The set also comes with a launcher and if you can’t afford a stadium, it is tough enough to play with on any flat, metal pan. Take your Beyblade winning streak to the next level with the powerful Z-Achilles famous for being one of the few Beyblades to consistently defeat Winning Valkyrie. The pack comes with a two-way launcher and a Beyblade that is compatible with Hasbro launchers. Z-Achilles is very balanced, is able to resist attacks and the tip can change height from short to tall and vice versa. Though it can burst, this is a rare occurrence as many Beyblades have found out. So these are the top ten best beyblade burst toys that made it to our review. This review should serve as a guide when you decide to purchase the game for your kid(s). If your kid is already a Beyblade burst veteran, the smart move before placing an order is to ask them the type of Beyblade they need. They won’t be thrilled if you get an attack Beyblade when all they really wanted was a defense Beyblade. That said, the different types of Beyblades are in the review. So whether it is defensive, attack, stamina or balance Beyblade, you’d find it in our review. Note that the very best Beyblades burst has at least two of these qualities integrated into them.